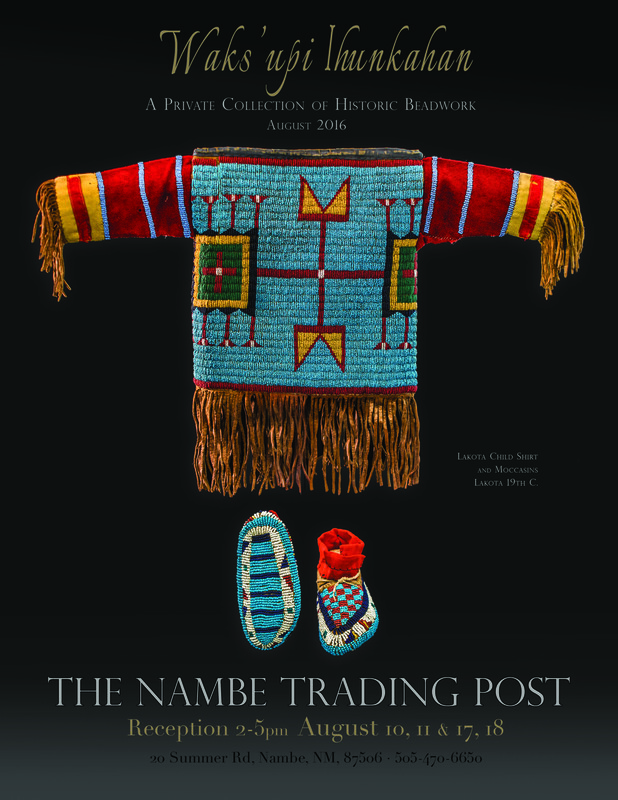 The first amazing stop on the High Road to Taos begins with the Historic Nambe Trading Post. 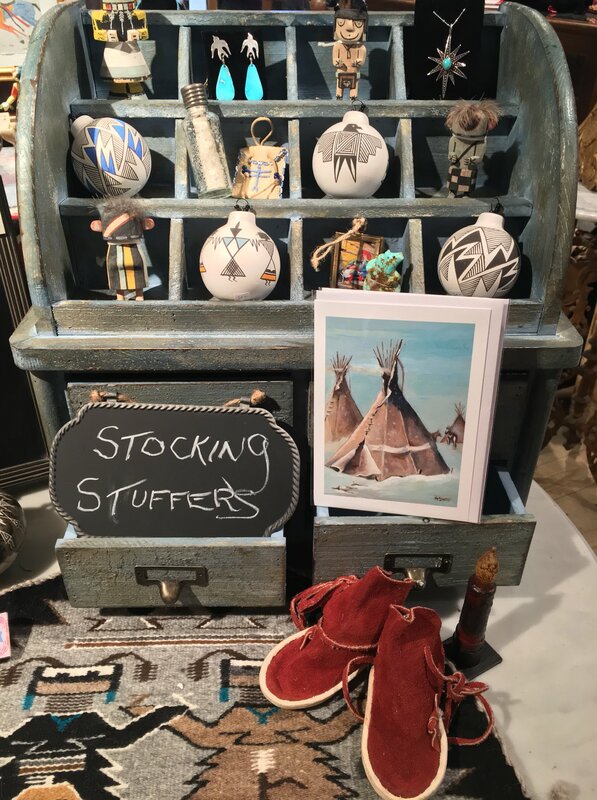 A jackpot of a gathering of authentic Indian and cowboy material culture, everything Made by Hand – by local artists and craftsmen from the surrounding pueblos and communities. 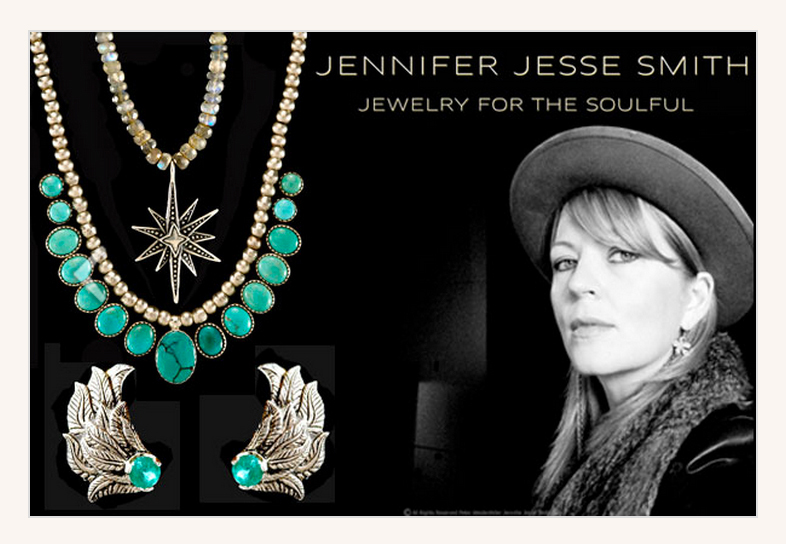 Western Movie Costumes by Emmy award winning costume designer Cathy Smith, Navajo weavings, pueblo pottery, micaceous cookware, baskets, Plains Indian Bead and Quillwork, Historic Paintings, Old pawn jewelry and the contemporary jewelry of Jennifer Jesse Smith, antique saddles, clothing, Pendeltons, buckskin, beads, and much, much, more. 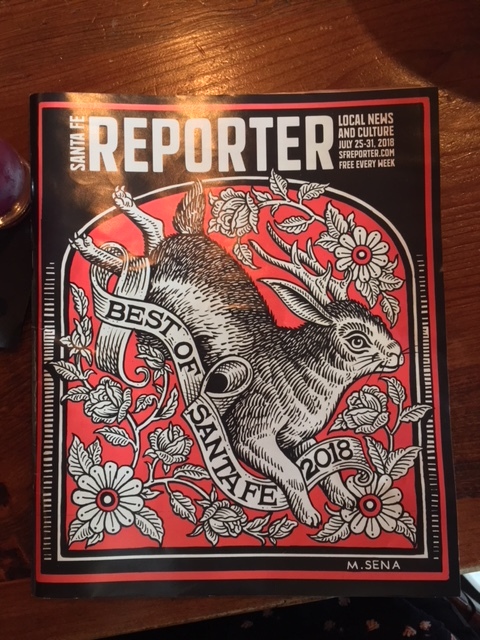 One of the last historic trading post of the Real West and THE NEW SPIRIT of OLD SANTA FE. 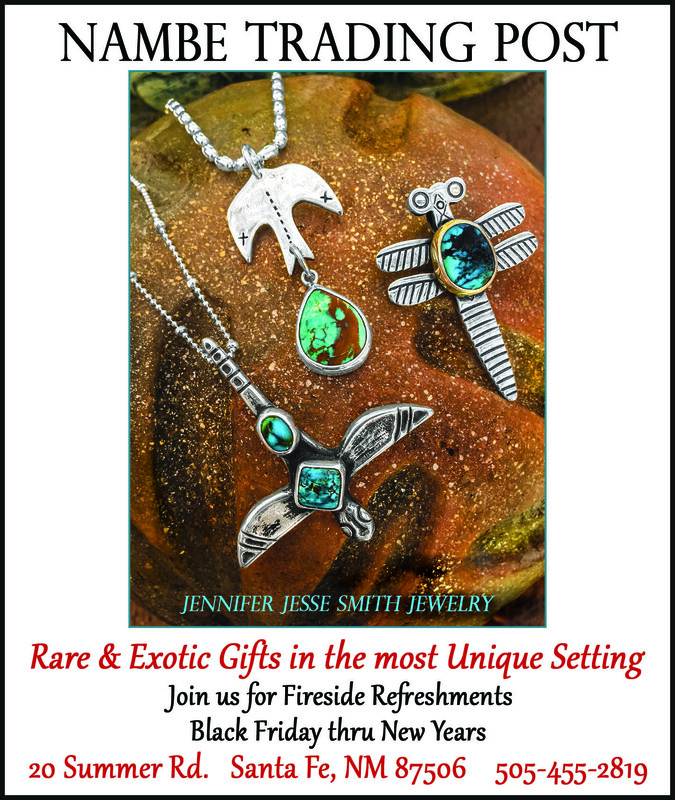 Please call 505-470-6650, 24 hours in advance for a visit to the Trading Post. 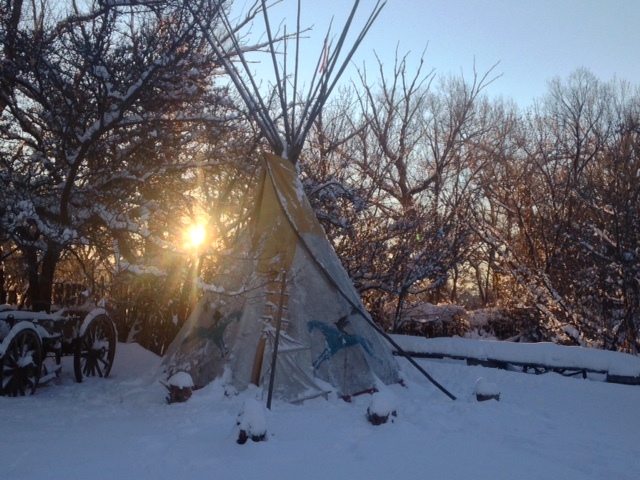 Have a wonderful Winter and see you in the Spring! 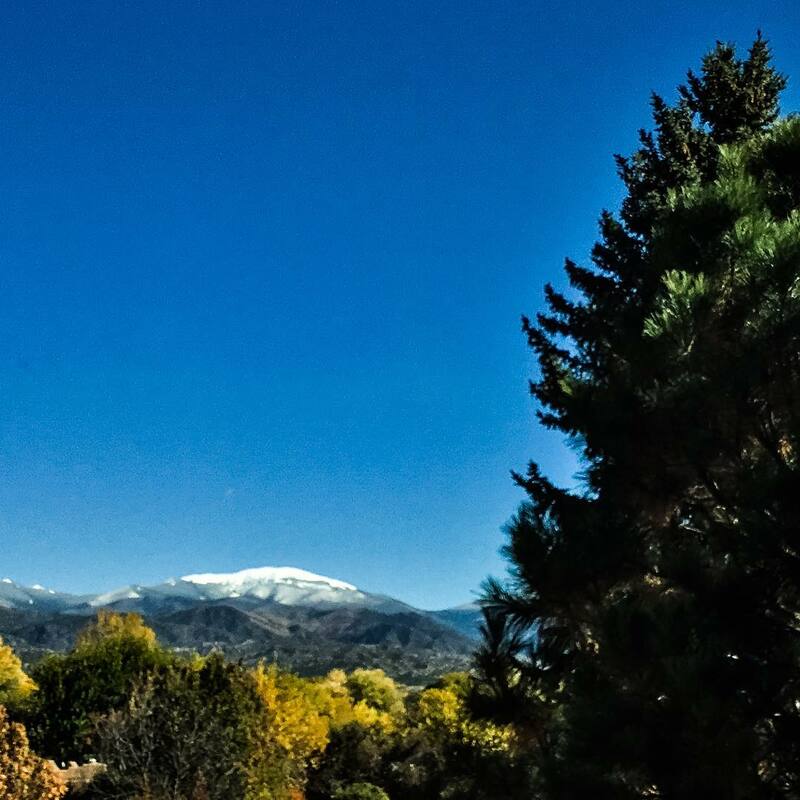 The fireplace is blazing and the cider is mulling – come out to the beautiful Nambe Valley! 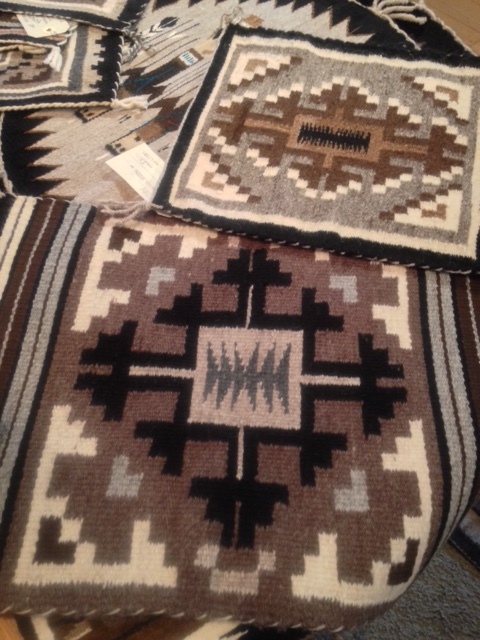 We are proud to show Two Grey Hills weavings from the Toadalena Trading Post now at Nambe! Come in and shop our incomparable collection of Master Weavers! 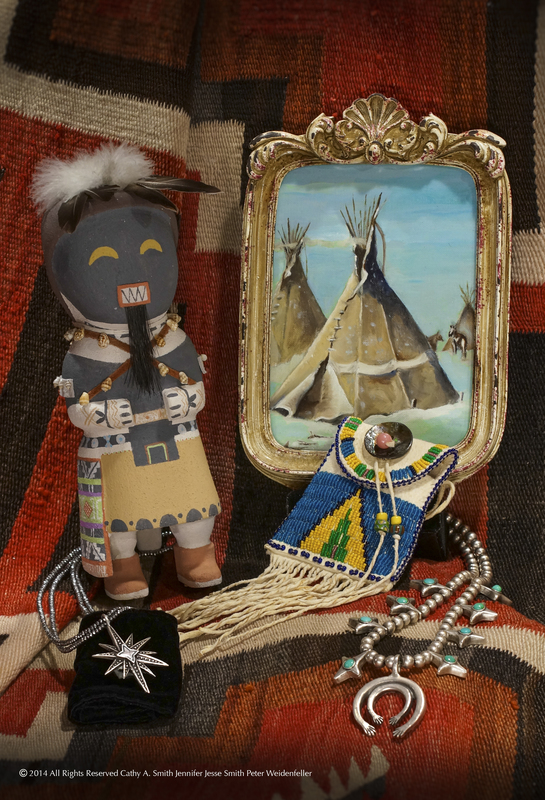 The birth of Two Grey Hills weaving, as we know it today, occurred around 1911. 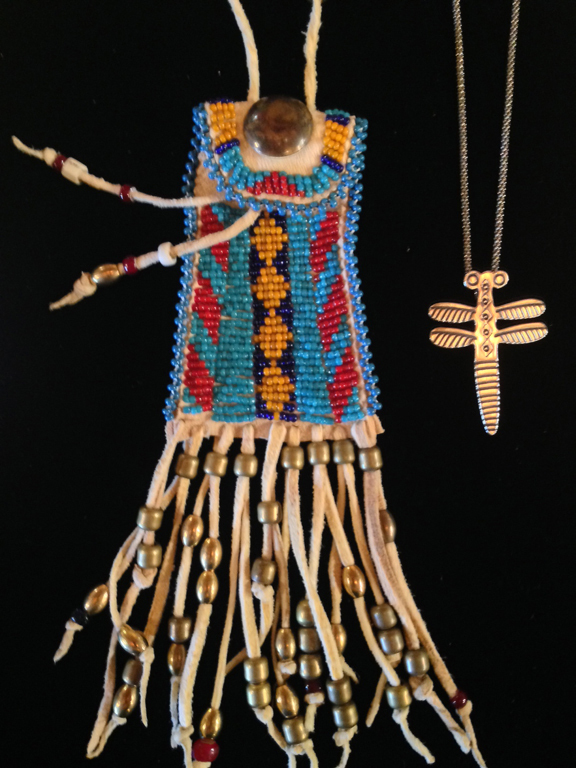 As demand for Navajo weaving was increasing, prices were soaring. 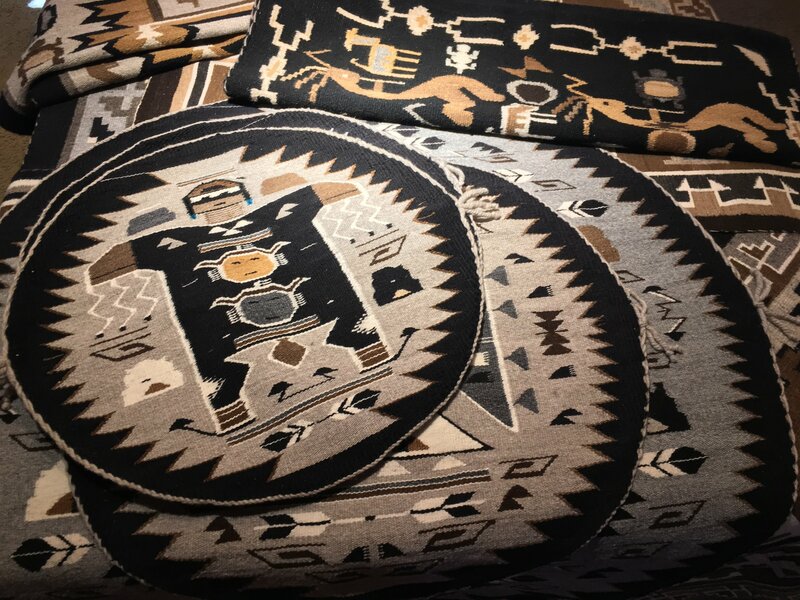 Traders were working diligently with the weavers throughout the Navajo Nation to develop marketable designs, which ultimately characterized the different regions of the reservation. 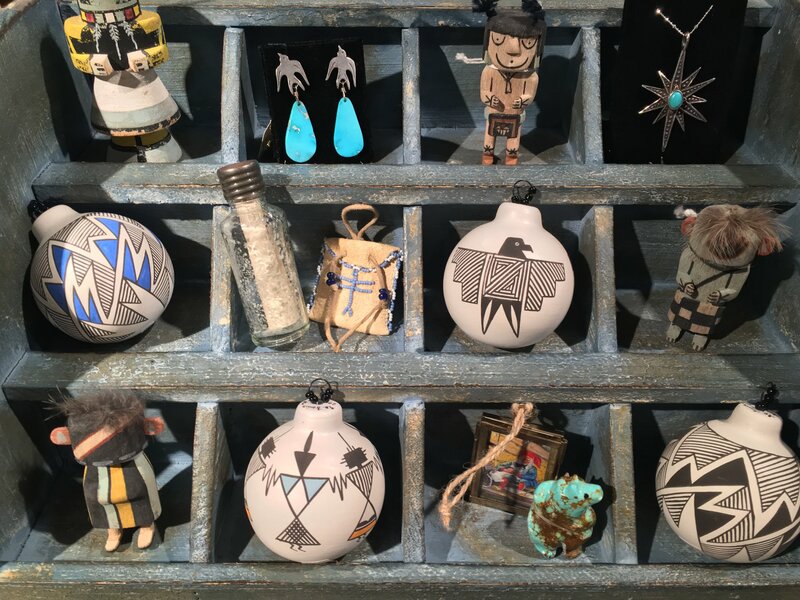 Thirteen regional designs within seven weaving districts eventually emerged, each named for its local trading post: Teec Nos Pos, Pictorial, Two Grey Hills, Crystal, Wide Ruins, Ganado-Klagetoh and Storm Pattern. The Bloomfield and Davies era. At Toadlena Trading Post, George Bloomfield had become friendly with his neighbor Ed Davies, who owned the Two Grey Hills trading post down the road. Together they worked with the local weavers to develop an improved textile that would be marketable to collectors. 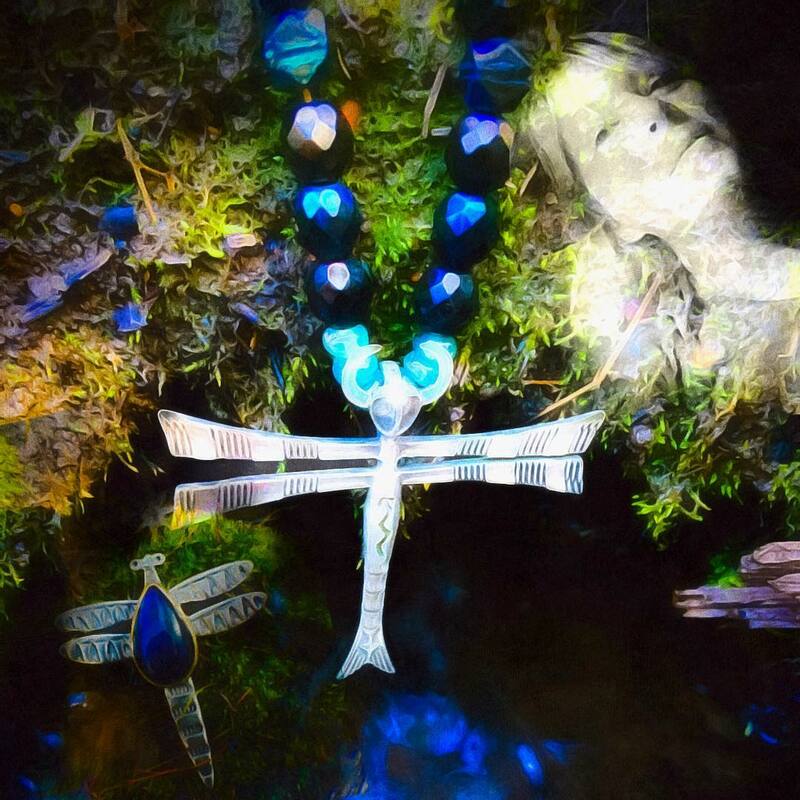 Use of natural color and hand spun fiber, fineness of weave and more intricate design patterns were the chosen path. Red was not the color of choice. 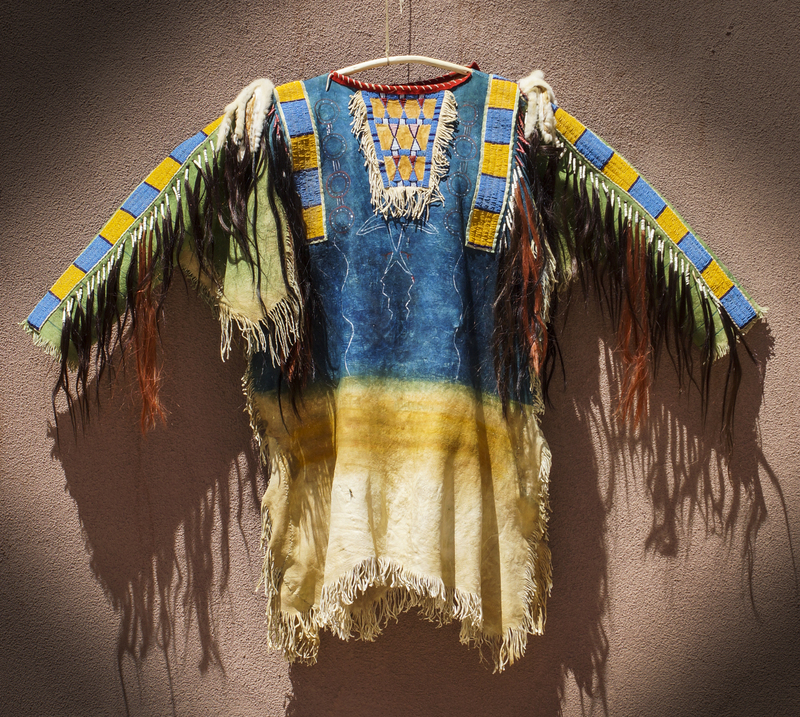 Late 19th, early 20th century Navajo textiles were dominated by the commercially dyed reds of the Ganado-Klagetoh rugs and the psychedelic Germantown pieces. The weavers of Toadlena/Two Grey Hills did not like to use of such flashy colors in their textiles. They preferred the natural colors produced by the their sheep, blending them together by a process called “carding,” which produced a broad palate of natural hues. 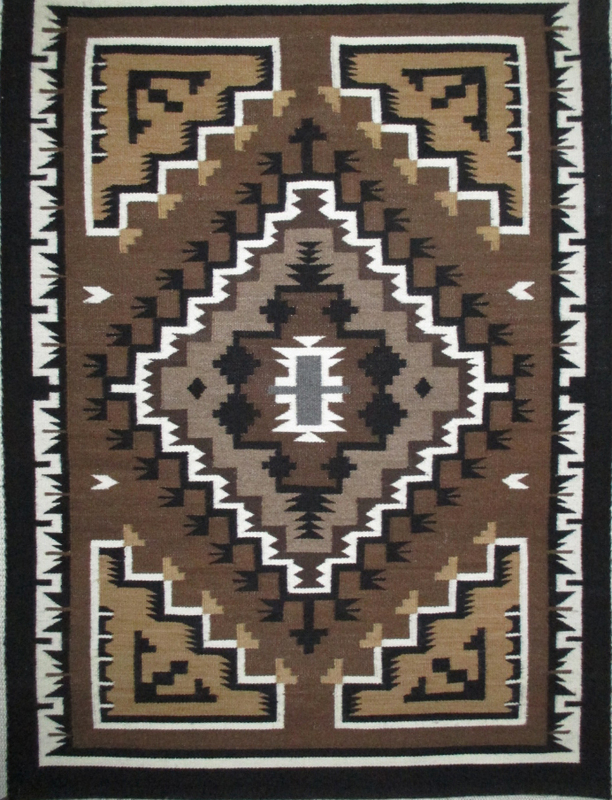 Black, gray, beige, brown, cream and white are the signature colors for a Toadlena/Two Grey Hills textile, which makes them easily distinguishable from other Navajo weavings. These textiles became technically superior. 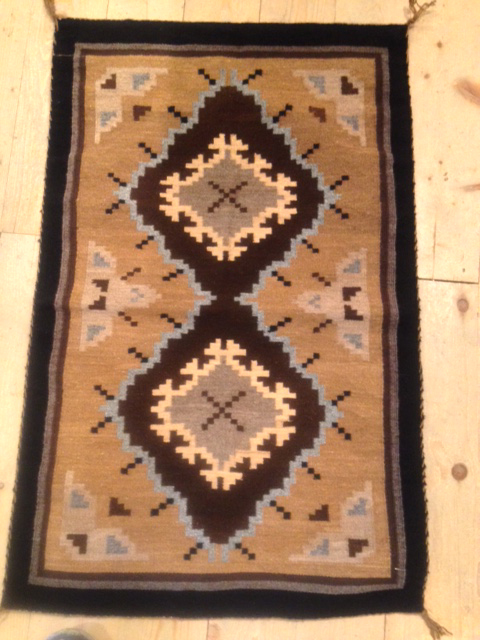 A typical Navajo rug has approximately 30 wefts to the linear inch. A Two Grey Hills from Toadlena average about 45. 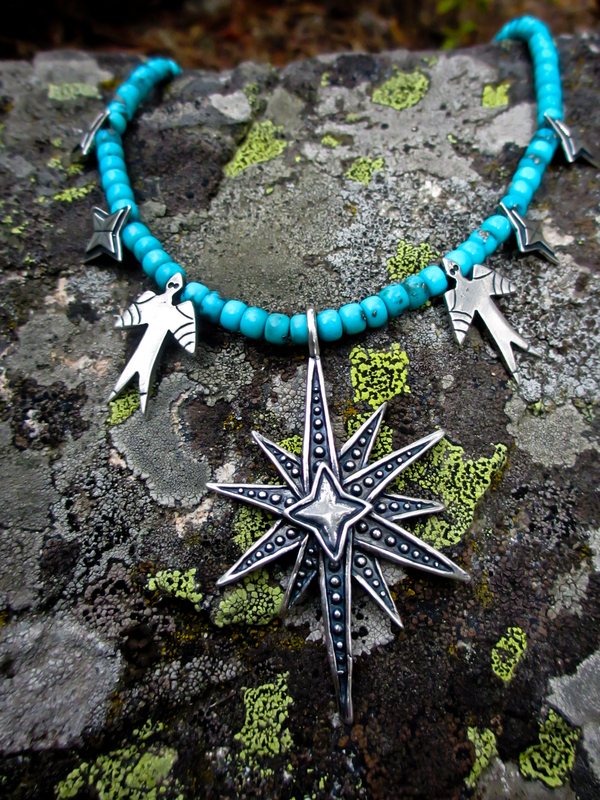 The finer pieces frequently have upwards of 80. 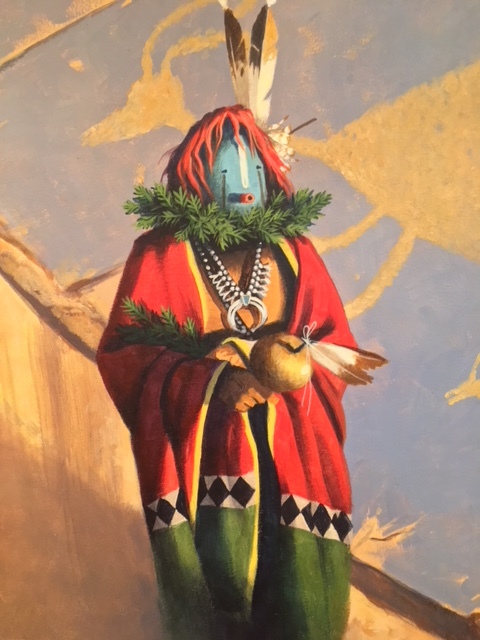 When a textile has 80 or more wefts per inch, it is considered a tapestry, not a rug.The most famous weaver of these textiles was Daisy Taugelchee (1909-1990), who wove upwards of 115 wefts per inch, which created the most finely woven Navajo tapestries anywhere. The finer weave allowed for the emergence of intricate geometric forms that covered the entire weaving, while a border around the perimeter of the textile became the norm. 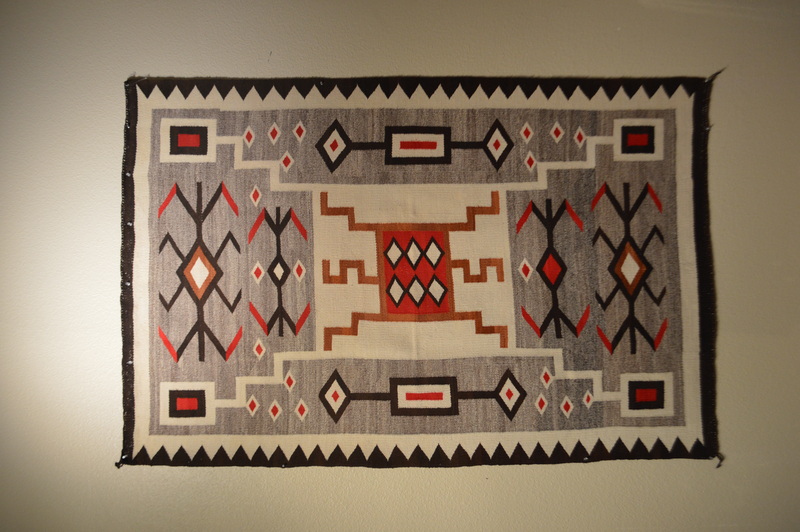 This use of borders in all Navajo as well as Toadlena/Two Grey Hills design emerged because collectors were now using the weavings as rugs rather than blankets.The patterns of the Toadlena/Two Grey Hills textiles became more complex over time. Today, they are dazzling juxtapositions of intense blacks with muted natural hues that inspire awe from those who see them. Many years of collaboration between Bloomfield, Davies and the weavers created the spectacular Toadlena/Two Grey Hills textile that is highly coveted by collectors around the world. Today, all the Toadlena weavers from the Two Grey Hills are ancestors of those who worked with those two very inspired traders. The tradition continues with current Toadlena trader, Mark Winter. 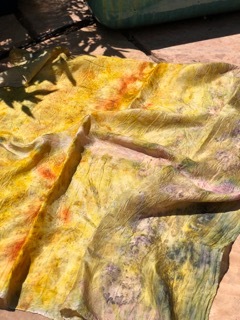 Join us as fiber artist and natural dyer, Wendy Getchell, shares the magic of dying & imprinting fabric with flowers and botanicals. 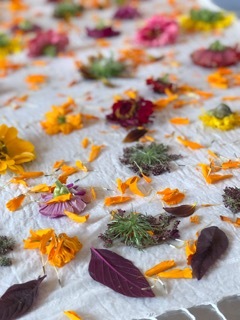 We will begin with a discussion of natural dye techniques & history, then forage into Cathy Smith’s garden to choose flowers and leaves. 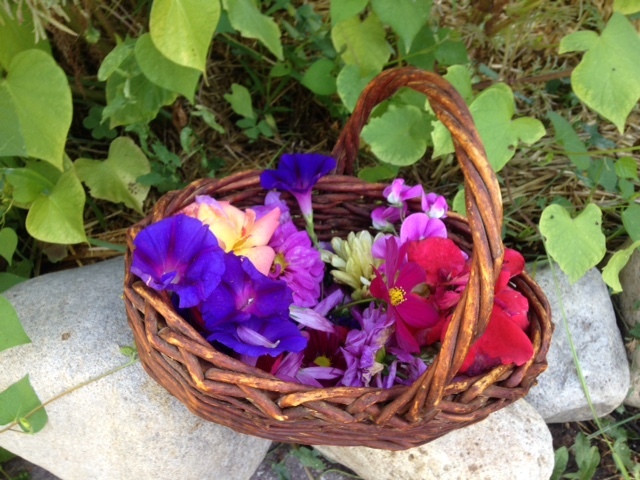 These will be arranged on cotton shawls and then steamed into the fabric. After much experimentation and great fun we will end the day with a group review of our creations, sharing with one another the one of a kind fabrics we have handcrafted. 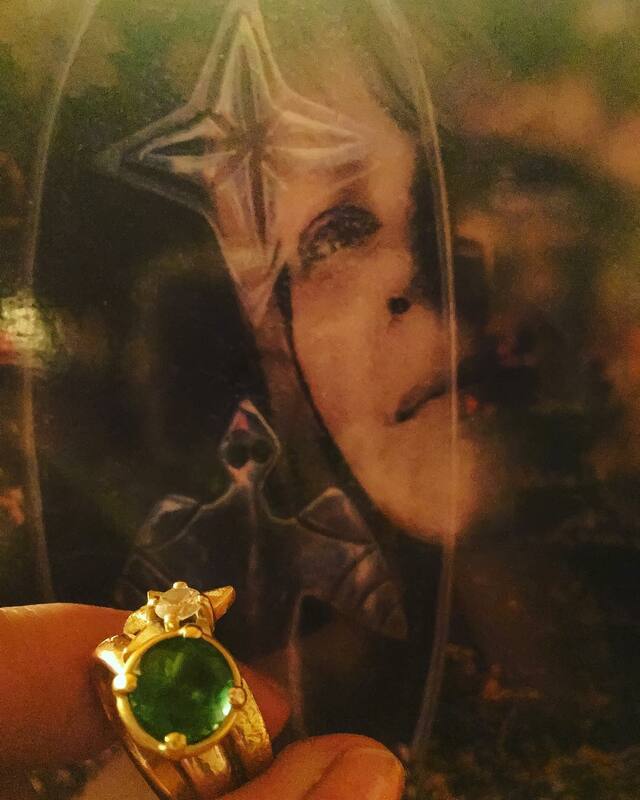 *All dye materials as well as light refreshments and snack. 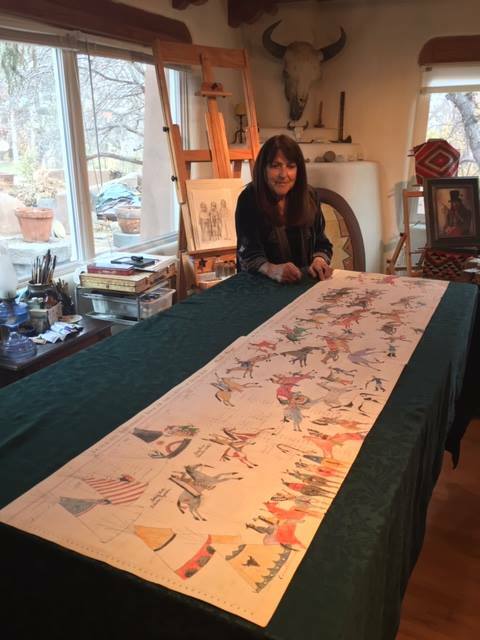 *24″ x 80″ Cotton shawl with tasseled fringe, plus 2 yards of silk ribbon and test fabric strips. 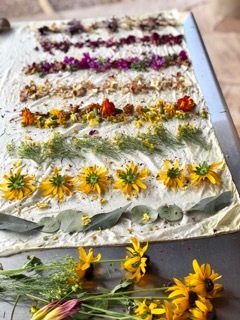 *Techniques for laying out and preparing botanics. *Methods of rolling, tying and heating bundled materials. 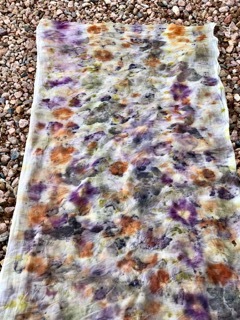 *Discussion of other natural dye techniques. NOTE: Please wear comfortable clothing that you don’t mind staining & comfortable walking shoes. Bring a water bottle, and feel free to bring your own flowers and leaves for dying. 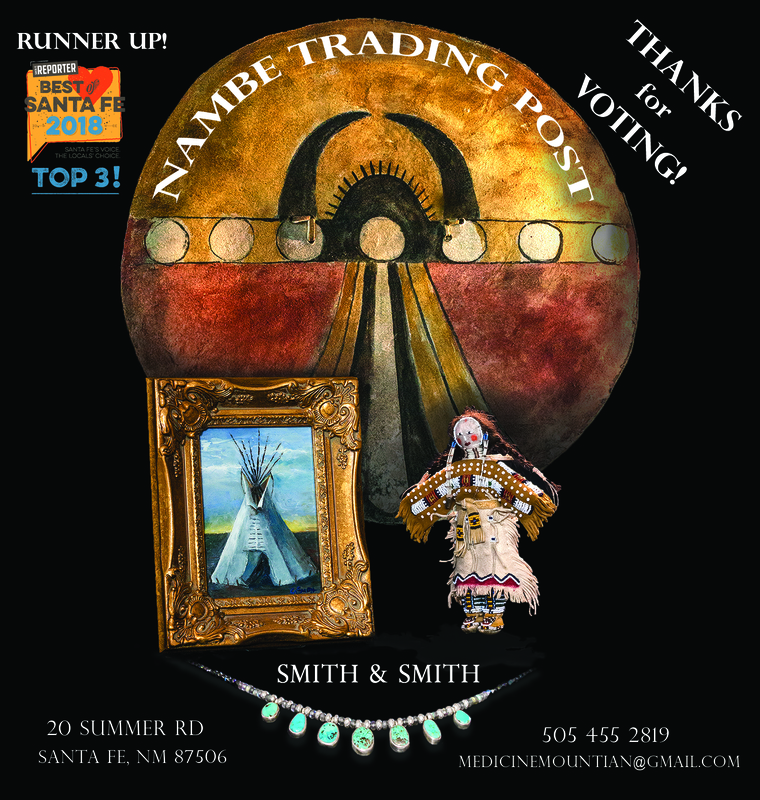 Please call the trading post at 505 455-2815 to enroll. 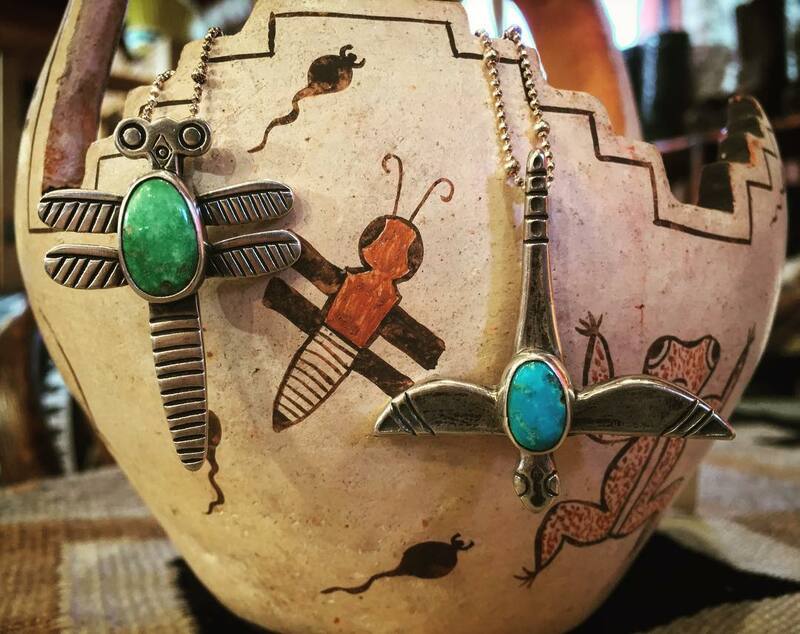 Featuring Native artists from the Plains, Prairie and Pueblos!